Get together with other sailors to share stories and tips about sailing in Southeast Alaska at new Sailor Talk events hosted by SEAS. The new monthly talks, organized by the group’s education committee, are open to both members and nonmembers—“anyone interested in the magical process of moving a boat through the water with only the wind” said the club’s Commodore, Jim Mahan. While there will be some organized sharing with occasional presentations, the gatherings are intended to be informal and allow all present to join in the discussion. High Noon Withstands Lyric's Furious Rally to Win! High Noon, Lyric, and Optiminium gathered at the north end of Portland Island on June 19, for the start of the inaugural Admiralty Island Rally (AIR). The three skippers agreed to move the starting line farther up Saginaw Channel due to the light wind. 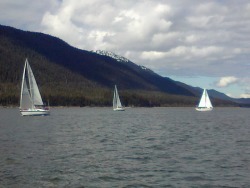 The start was moved to 11:30 and the boats reached across Lynn canal in light conditions toward Whitestone Harbor. The conditions frustrated the boats until all three retired before motoring into Whitestone Harbor. On the 20th, the boats began leg 2 at 8:30 in a moderate southerly breeze. The boats were beating south down Chatham Strait as the breeze began to rise, and the day wore on. By evening the waves were beginning to get quite large, and breaking. The breeze had built to 25 knots, and the boats were really slogging their way south. High Noon took advantage of her upwind capabilities to really stretch a lead and get into Warm Springs Bay after 2300, eight hours in front of the second place finisher, the tenacious Optiminium. Lyric retired in the evening at the south side of the mouth of Peril Strait by Catherine Island, and motored into Warm Springs the next morning about four hours after Optiminium finished. Read more about High Noon Withstands Lyric's Furious Rally to Win! 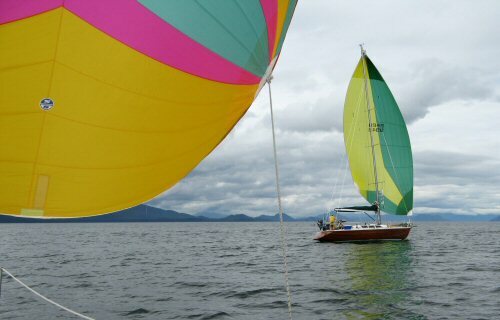 May 29, 2010 dawned sunny and windy, perfect weather for the annual SEAS Cup Memorial Day Taku Harbor races. Nine boats lined up for the starting gun in the 15 knots of breeze, and thanks to the committee boat, F/V Mohap, the 10:20 start was fair and clean. Haiku and Lyric got the best start, and had a great taking duel the entire way up the channel. Despite a poor start, Freebird, caught the other two boats, and took over the lead never to relenquish it to Lyric and Haiku. The wind stayed strong for the first few boats, but began to moderate later in the evening. The Initial 2010 SEAS race was foiled by an evening calm. The sailing vessels Tango, Commitment, L'oaa Nalu, Surprise, Lyric, and Haiku gathered near Marmion Island for the horn that would start the 2010 SEAS Cup series. A new idea was being tried this year, one where the Race Committee chair would call the race at the starting line based on the conditions. At 1100, the boats were at the line. It was an hour past high tide, with the current racing out of Taku, Stephen's Passage, and Gastineau Channel. Taking the current and the variable direction light winds in mind, Wade Rogers, Race Committee chair, made the only sensible decision. A race around Grand Island, hoping for the more open spaces to offer more wind and a slight current help until the boats reached the breeze.